So after my disastrous run on Tuesday I made an appointment with a Chiropractor who has treated me (and many of my friends) in the past for various sports related issues. I was hardly walking when I went in on Tuesday. I was sent out with a prescription for lots and lots of icing, a lift in my left heal, and no walking without my shoes on. By 8:00 Tuesday night I was almost walking normal again! I went back the next day (feeling even better) and Dr. Chris taped up my calf. I think I am going to make it to the start line at Boston!!! It will not be the 3:30 I was originally hoping for but the real goal is IM Wisconsin so I am totally ok with that! I am injured. I pulled my calf on the treadmill a week ago. I just did my first run since then. I had spent the last week trying to rest and rehab it. Well, it didn’t go so well. I made it through the run with out experiencing severe pain only 2/3 out of 10). But now that I am done I am limping around the house. I will go see the PT guy who has been very helpful in the past and hope that he can make me not injured! I have already let go of setting a PR. Now all I want is to finish. Yep. I DNF’d. I was hoping for, at the best, DFL (dead f#*king last) but after 45 miles I said no more!! If you haven’t heard of the Rock Cobbler (which I kind of doubt you have) it is a 80-90 mile ride over and any and all surfaces in Bakersfield CA. Stuart found this race last year and FOMO got the better of me this year so I signed up! I knew going into it that there was a better than average chance that I would not finish. Gravel riding is not my forte and I don’t have much access to it to practice. Coupled with the fact that I have a very high sense of self-preservation, I knew I was in for a long day. Forget what you may think about Bakersfield, the course was beautiful (even if we rode by a fair amount of trash; just part of the Rocks Cobbler charm). The route took us onto some private ranch land (that is why there is no link to the course in this write up) that was just amazing, especially after all the rain. Yet, the course was beyond challenging for me. I struggled both with the climbing and descending which was pretty much the whole course! There were long sections where we were riding along a very small path (12 inches wide) on the side of a hill. I was reduced to walking many many many times. The picture above shows a section I never even made it to. The cyclists are hiking their bikes up a section of trail that is 42%! Oh, and the people at the top are throwing beach balls at the cyclists! This is not an event for the faint of heart or people with no sense of humor. At mile 45 I rolled into the aid station in tears. I decided I just couldn’t do the last 40 miles of whatever was coming my way. I decided to roll back to the start and lick my wounds. By the time I got back I had done 66 miles with 4,000 feet of gain (all collected over the 45 miles of the course I did complete.) 7:25 elapsed time with 6:34 of riding time. It truly is one of the most unique and challenging things I have very attempted. Neil Shirley is an amazing cyclist and past winner of the Rock Cobbler. His write up shares some amazing pictures from the day. You can read more about it here. 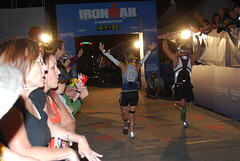 I have decided that from here on out I need to concentrate only on events that support the goal of qualifying Kona. Gravel riding doesn’t help me much for that one. I am going back to just cheering for Stuart at these events! Braids ready for a big day! Casey, and online friend, now an IRL friend. She did amazing!! Water crossing was not too bad at all! This was the scariest section for me. The path was super narrow and dropped straight down! ..and that is what makes it worthwhile! I had a quick conversation with a friend online the other day and she said “there are no shortcuts”. This really struck a chord with me. I see a lot of people who just aren’t willing to work for their goals. Its gets tough, and people come up with all kinds of excuses why they couldn’t do it. They want a shortcut, an easy road. I have learned over the last 3 years of structured training, THERE ARE NO SHORTCUTS! (sorry for yelling) But that is what makes it totally worthwhile and so satisfying! This year I am tackling every aspect of training I can. Building strength is something I think I really need to do. I have been making a huge effort not to skip my strength and core sessions (like I may have done in the past). Lucky for me, my coach Jen is giving me the tools to succeed with this one! Short, to the point videos, of what I need to do. This year my coach Jen is starting things off a bit differently for me. We are doing a couple of sport intensive blocks of training. We stared with cycling since I have a 90 mile gravel ride coming up this weekend (what the heck was I thinking!). I really enjoyed all the cycling and we capped off the training block with an FTP test. I had a 3 watt increase to 187 so I was very pleased! 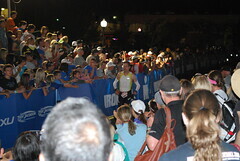 I am hoping to get my FTP by September for Ironman Wisoconsin to give me the best shot possible at getting that Kona spot! Speaking of Kona spots, I have applied for a chance to have my Quest for Kona documented for a TV series Ironman is putting together. It would be a really amazing opportunity and I think I have a unique and positive perspective on training and juggling a very busy life! You can see my 2 minute video entry below. I think I would be a great fit for the project. I just hope they do too! I will post a race report (hopefully that includes a finish) from the Rock Cobbler this weekend. I am not gonna lie, this is the first race I am truly not sure I will finish. Next up.. a run intensive block just in time to kick start my training for the Boston Marathon!